Jason Aramburu started working on biochar as a research scientist in 2005, through Princeton’s Climate Mitigation Initiative and the Smithsonian Tropical Research Institute and in 2008 formed re:char. 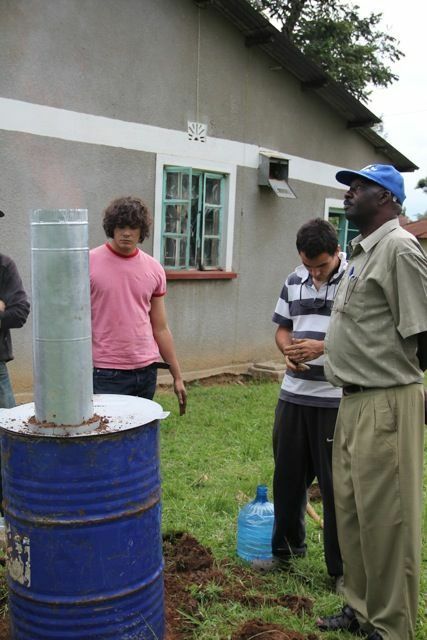 His initial intention was to develop fast and slow pyrolysis systems for farms in the US, however after he connected with an organization in Western Kenya, Aramburu saw a real need for biochar and a great potential for rapid scale-up. Re:char now focuses its work to empower subsistence farmers in the developing world to enhance their crop yields and supplement their income through biochar production and use (which can also improve soils and sequester carbon). The organization has raised over $370,000 to date to support this work. Specific funders include the Hitachi Foundation, Echoing Green, the Dutch Postcode Lottery, and DOEN Foundation. With small farmers in Western Kenya spending more than half of their annual income on fertilizers, they are interested in new means to improve their soils. Not only are the fertilizers detrimental to the environment and to household economics, but the ammonia in these fertilizers can lead to acidification and thinning of agricultural soils over time. To reach out to local farmers, re:char is partnering with Salim Mayeki Shaban and his organization ACON, a farmer’s association in Western Kenya, located in the Bungoma area. ACON had been experimenting with biochar additions to farmland with positive results, but was looking for a way to produce sizable amounts of biochar on site using crop waste (mainly sugarcane). They were also interested in an affordable kiln which farmers could purchase to produce their own supply of biochar for their fields. The proposed answer to an affordable, but scalable unit, is re:char’s Climate Kiln—a small pyrolysis system capable of generating biochar or fuel charcoal. The team has designed and is deploying this unit which can produce 3 – 5 tons of biochar annually. Says Aramburu, “In Kenya, our farmers have taken to calling our device a Rutuba Kiln. Rutuba means ‘soil fertility’ in Kiswahili (the national language of Kenya).” The kiln is placed in a shallow pit with an adjustable primary air inlet made from wet mud. This design allows users to have an adjustable size air inlet at virtually zero cost to give the user a high degree of control over reaction rate and temperature. Using mud for this inlet also dramatically reduces manufacturing costs. Together, ACON and re:char have been able to reach over 750 farmers in 30 villages in Kenya’s Western District. Their project work was profiled by the BBC in June 2011. However, even with reduced manufacturing costs, the Rutuba kiln’s material cost of $20 – 25 is still an affordability challenge for many smallholder farmers to who live on $1-2/day. The financial difficulty is even higher during the growing season when money is very tight. To increase affordability and payment options, re:char is exploring alternative financing techniques like micro credit and layaway to help farmers pay for the equipment and even out the annual sales cycle. The team is also starting to leverage m-pesa, Kenya’s highly successful mobile money platform, to take payments via SMS. Mobile payments work just like a debit card for people without a bank account, and help to minimize fraud and loss. In rural Kenya, delivery of finished goods is costly and challenging due to a lack of transportation infrastructure. Global shipping is also a huge source of carbon emissions. To counter some of these issues and have a larger onsite presence, re:char completes a significant portion of their manufacturing and assembly onsite, using digital fabrication techniques. This allows them to manufacture the kilns using locally-available materials, at a cost lower than outsourced manufacture, while providing skilled jobs to the region. An additional benefit is the ability to quickly make design changes based on feedback from the local population. To further the idea of a mobile workshop, in September 2011 re:char will send a 20 foot shipping container from Austin TX, United States to Bungoma, Western Kenya. This container will not only ship production materials but once arriving onsite, will serve as a full facility—a metal workshop complete with lighting, ventilation, electrical wiring, and a CNC plasma table for full production work. Re:char’s idea is to create a completely modular, replicable, portable workshop, send it to their base in rural Western Kenya, and begin testing production of the Rutuba kiln along with various iterations as suggested by customers. To reduce “engineering at a distance”, re:char is bringing production directly to customers, and expects to have the production flexibility to fill local needs. Looking forward, re:char is hoping to send additional mobile workshops to Tanzania and Eastern Kenya within the next three months. From there, they will explore opportunities overseas in Haiti and India, believing that the workshops will allow them to locally design and fabricate a variety of tools to improve farmers’ lives—beyond the initial Rutuba Kiln—that are well-suited to local needs. Members of re:char and ACON add biochar to soils; all photos courtesy of re:char. 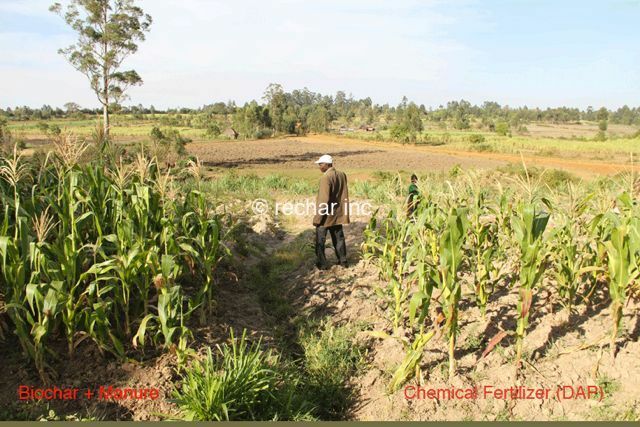 Comparing biochar/manure amended plots to chemical fertilizer amended plots. Observing the re:char unit in action. 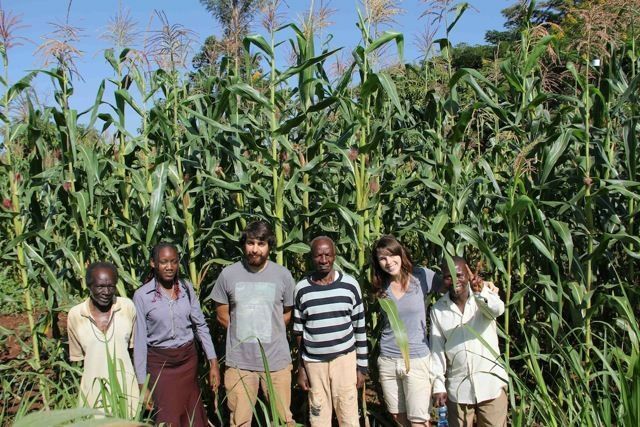 Members of the re:char team with David Guerena (3rd from left), Cornell University, in front of Maize treated with biochar at a field site in Kenya.